What principles enabled the concerned mom of two junior high school students to move from deciding she needed to pray for her kids at school to becoming the founder of a worldwide prayer movement called Moms In Prayer International? Fern Nichols is a passionate believer in the power of prayer. She knows that a regular habit of prayer can change things--can bring home wayward children, heal broken marriages, and provide answers to desperate situations. Prayer can also bring a new kind of peace and contentment no matter what hardships or disappointments we face. But most important, Fern knows that through prayer we can experience, firsthand, an ever-increasing intimacy with God. 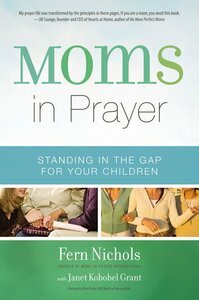 In Moms In Prayer, Fern Nichols reveals how she teaches women to pray in a way that changes their lives and the lives of those they love. She teaches the principles and practices that will not only revolutionize the way people think about prayer, but the way they do pray, leading them into a deeper intimacy with Jesus, who is always interceding on our behalf. Sparkling with real-life stories of God at work in the lives of praying moms, Fern introduces us to the four prayers that are the foundation of the Moms In Prayer approach to prayer: Praise--Praying according to the attributes of God Confession--Breaking strongholds Thanksgiving--Expressing a grateful heart Intercession--Standing in the gap with Jesus. What transforms these well-known elements of prayer into such a powerful force in Moms In Prayer International? Fern Nichols introduces a way of praying that energizes, creates an appetite for intimacy with God, overcomes spiritual paralysis, eliminates fear, unveils the heart and character of God, and transforms the pray-er's life and perspective. She teaches how to pray effectively with others, how to prepare for the spiritual battles that swirl when prayer is on the move, how to persist in prayer in the face of hopelessness and despair, and how to use Scripture for effective prayer. God hears. God acts. God moves. God works. Fern Nichols is the mother of four children and the founder of the international organization Moms in Touch, a prayer movement that has affected thousands of women throughout the world. Since its inception, Moms in Touch groups have spread to every state and to more than ninety-five countries. Translated into twenty-two languages, more than 410,000 Moms in Touch International booklets have been sold. A frequent guest on Focus on the Family, Fern has also appeared on the Truth That Transforms and Family Life Today.